As a brand with a reputation for producing stunning exercise bikes, we’re always keen to get our hands on exercise bikes from DKN. We were initially confused when we saw pictures of the new EB-2400i as it looked near identical as the EB-2100i which has been around for a few years, but now discontinued. At the time of the original review, we did like the EB-2100i, so how does this model fare in our hands? First, the assembly: With each component packaged really well, the bike was delivered in perfect condition. Once out of the box, the assembly was straightforward with clear instructions and good diagrams to guide you through. Like the other bikes in the DKN range, the main body is in one piece so having attached the front and rear stabilisers the rest of the unit went together quickly enough. It took one of us around 30 minutes in total to get it up and running which is about what you’d expect. How does it look in the flesh? 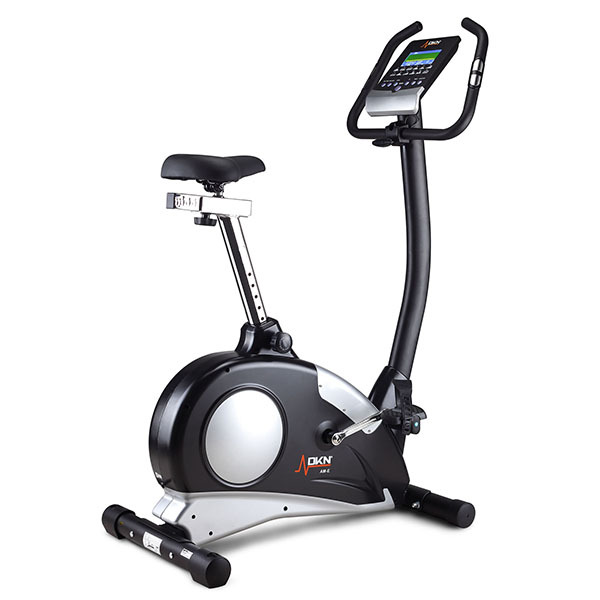 It’s obvious from the first look that the EB-2400i is more heavy-duty bike than the typical upright bike for home use. With its big stabilisers, thick seat post, big seat, thick front post, oversized handlebars and a big computer, this is an imposing exercise bike that looks more than able to handle serious workloads! If you saw one of these in a high quality gym, it certainly wouldn’t look out of place. Achieving a comfy position on an exercise bike is critical. With the EB-2400i, this should be possible for pretty much everyone with the seat being adjustable for both height and reach and a nice feature is that the console tilts so that users of different heights can see the display with perfect clarity. We’re pleased to report that the seat is nicely padded and comfortable. Like a lot of bikes in commercial gyms, the handlebars have a fixed position but it’s still possible to get a good riding position and the handlebars being fixed makes them sturdy enough to support weight when used in racing position for intensive training. The seat is large and padded and unlikely to cause the initial saddle-soreness that you often get with more entry level bikes. So, what’s it like to use? 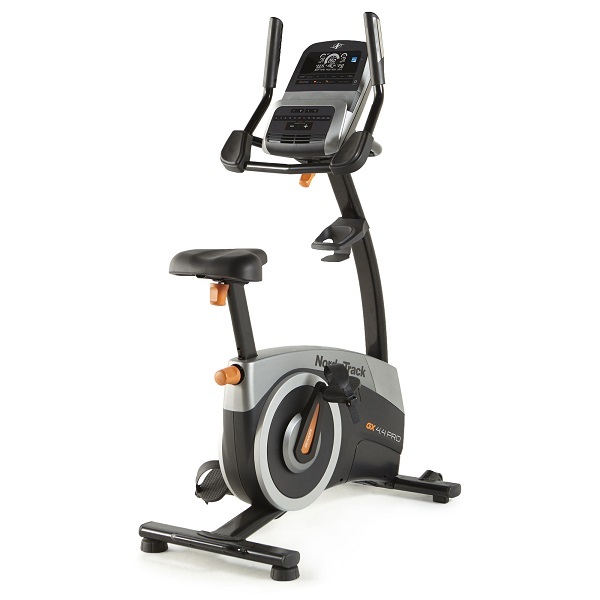 With its substantial frame, this is one stable exercise bike when being used. It’s solid and doesn’t shake or wobble at all. The pedalling action is very smooth and this will be thanks to a combination of the very hefty 14kg flywheel as well as heavy duty crank and other components. The console has a dual colour, LCD display at its center, which displays key workout stats in dedicated windows. When being used in manual control mode, resistance can be changed simply by using the the up and down buttons in the middle of the console. It was when changing resistance that the mystery of the difference between the new EB-2400i and the original EB-2100i becomes clear: Resistance changes are silent and very fast thanks to this model having electromagnetic mechanism rather than servo assisted magnetic resistance. In the lower cost, servo based mechanism, a little motor physically moves a strip of magnets closer or further away from the flywheel to vary the resistance of the bike. In an electromagnetic setup, there are no magnets at all and there is a coil that’s positioned at a fixed distance and its level of magnetic properties is controlled by varying the amount of current going through it. 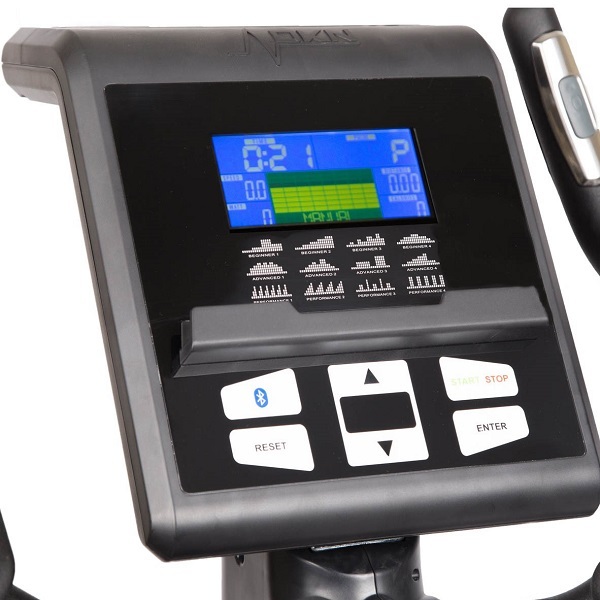 This has a number of advantages: Changes in resistance take very little time, making the EB-2400i suitable for interval training; With no moving parts involved in the resistance mechanism, the calibration of the resistance doesn’t drift over time and finally, the bike itself will be more reliable long term. There are plenty of pre-set programmes available and their profile is printed right on the console itself. The fact the pre-set programmes are scalable really does add to the appeal of this console unit as effectively it means there’s pretty much no chance of ever outgrowing the bike, no matter how fit you get. In addition to the manual and a target Watt mode, there is heart rate control available on the console. We’re pleased to see that the console has a Bluetooth based heart rate receiver as these are more reliable than the traditional, analogue based receivers based on Polar’s protocols. In addition to having Bluetooth for heart rate, the EB-2400i’s console has Bluetooth receiver that is compatible for a couple of third party apps such as Kinomap. This allows the third party app to control the resistance of the machine and makes for very entertaining workouts to take away the boredom that can often set when doing long training sessions. The warranty on the EB-2400i is DKN’s standard 2-year warranty. 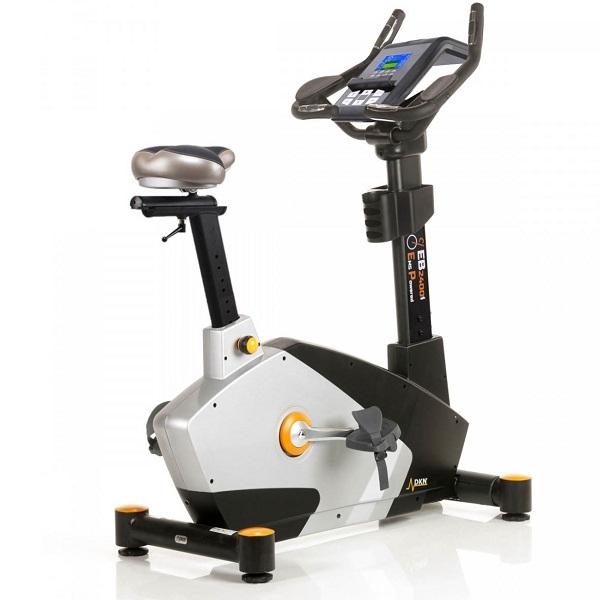 Realistically, we can’t see too many people needing to use this as it’s a very solid machine and the EMS resistance mechanism pretty much eliminates the most common faults that occur on exercise bikes after a long period of usage! At the current offer price of £599, the EB-2400i is a hell of a lot of bike for the money. 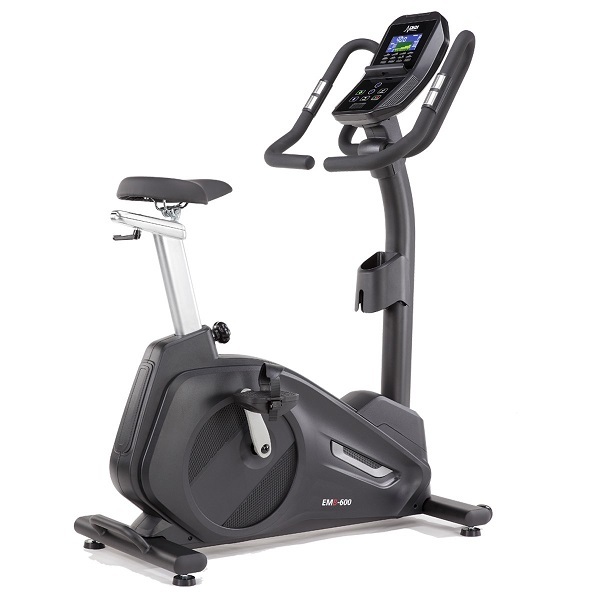 This offering from DKN gives the very best heavy-duty home use and light commercial exercise bikes from other brands a bit of a pasting in terms of value for money. If you’ve got the space for it, this is an easy product for us to recommend. At the current offer price of £599, the EB-2400i is a hell of a lot of bike for the money. 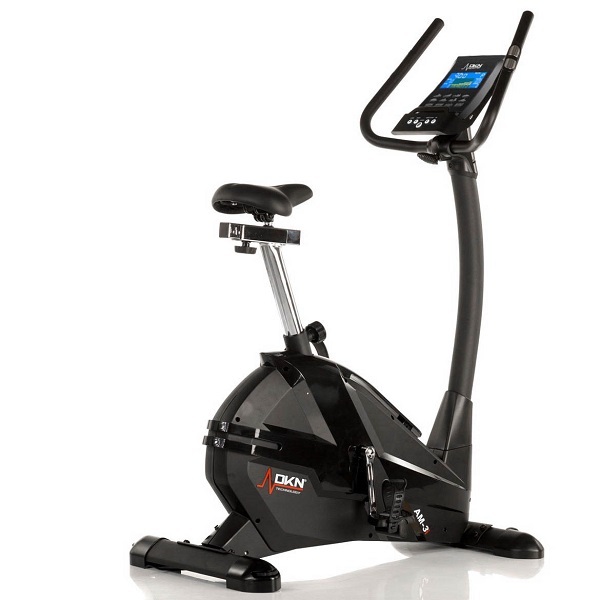 This offering from DKN gives the very best heavy-duty home use and light commercial exercise bikes from other brands a bit of a pasting in terms of value for money. If you've got the space for it, this is an easy product for us to recommend. 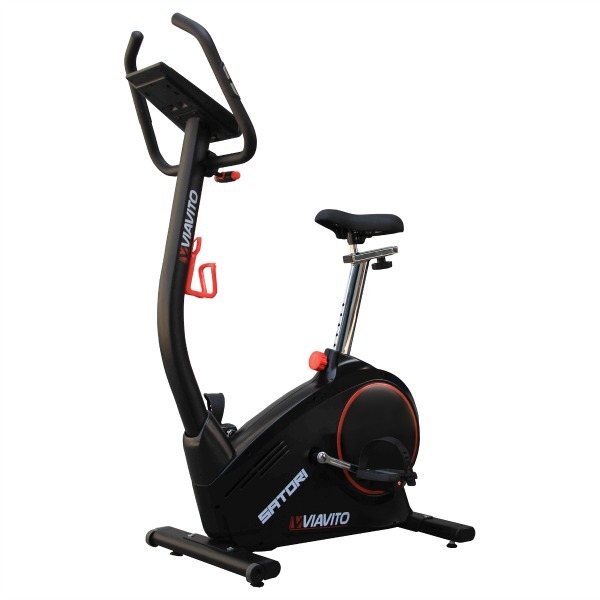 If your budget can stretch further, it'd also be worth having a look at the EMB-600 which offers an even smoother ride with a heavier flywheel and a very elegant design.